GREYSMOKE TACTICAL guarantees its GreySmoke Tactical Branded products against defects in material or workmanship for the life of the product. GREYSMOKE TACTICAL will repair, replace or substitute any GREYSMOKE TACTICAL product(s) if a defect in material or workmanship is found. GREYSMOKE TACTICAL will not warranty any product(s) that have been altered by the customer or a third party; and we do not cover any non-GREYSMOKE TACTICAL part that is causing the issue. Use of reloaded ammunition, damage caused to the product as a result of improper installation, or any alteration of the product will void warranty. For Non GreySmoke Tactical branded products, please call or email the manufacturer for their policies first. We will assist you with their warranty policy as necessary. If you have a warranty issue, please email us at sales@greysmoketacticalfirearms.com; we will issue you a return label. 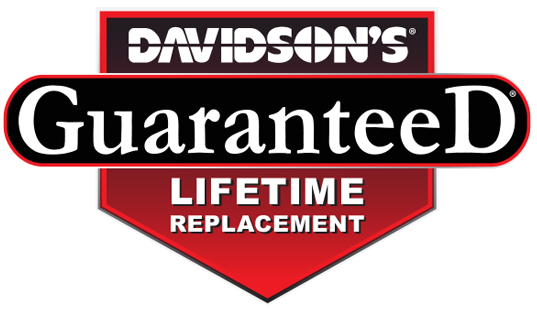 If anything ever goes wrong with any gun you buy with the Davidson’s GuaranteeD® Lifetime Replacement Warranty, it will be replaced. If no replacement is available, it will be repaired at no charge to you. Simple, just return it to the GuaranteeD® retailer where you purchased it, pay for the return shipping and upon receipt Davidson’s will ship you a *BRAND NEW GUN. So make sure every firearm you purchase works for you. Ask for the GuaranteeD® Lifetime Replacement Warranty. Davidson’s, Inc. warrants to you that if any gun sold by Davidson’s ever becomes defective, Davidson’s will replace the gun at no charge, subject to the following conditions. This warranty applies only if Davidson’s Supply Company sold the gun to the retailer from which you purchased it and extends only to the original purchaser from the retailer. In order to be eligible for warranty coverage, the original purchaser must complete the warranty registration online or return the warranty registration card to Davidson’s, Inc., at the address shown below, within 30 days from date of purchase. If no replacement is available, we will repair the original or offer you a similar model (to be determined at our discretion) free of charge. This warranty extends to any and all parts of the gun as originally sold by us, but does not extend to guns altered or rebuilt after their original purchase, or guns used other than for their legal intended purposes. DAVIDSON’S LIABILITY FOR BREACH OF ANY WARRANTY SHALL BE LIMITED TO REPLACING OR REPAIRING THE NONPERFORMING OR DEFECTIVE GOODS (TO BE DETERMINED AT OUR DISCRETION). WE SHALL NOT BE LIABLE FOR ANY OTHER DAMAGES, EITHER DIRECT, INCIDENTAL OR CONSEQUENTIAL. Some states do not allow the exclusion or limitation of incidental or consequential damages, so the above exclusion may not apply to you. To obtain performance under this warranty, you must return the product to the retailer from which you purchased the product and pay the cost of shipping the product to Davidson’s. If the retailer is no longer in business, you may contact another Retailer Near You or us directly at Davidson’s, Inc., 2625 Stearman Road, Prescott, Arizona 86301, 928-776-8055. This warranty gives you specific legal rights, and you may also have other rights which vary from state to state. Davidson’s will ship your replacement firearm the very next business day for all in stock items. You are only responsible for return shipping costs to us (ie: getting the firearm to Davidson’s through your retailer we do not accept shipments directly from end consumers.) Handguns are shipped out for next day delivery while long guns are typically received by your dealer within 3-4 days of shipping. If we do not have a replacement or you elect to get the same repaired firearm back, your firearm will be sent to the factory or an authorized warranty station for repair. If your firearm is repaired, the time frame until we return your firearm will be longer. Your dealer must have a valid FFL with original signature on file for us to ship and a current account with Davidson’s.